supernatural | The 8 Principles Of Goals And S.U.C.C.E.S.S. The 8 Principles Of Goals And S.U.C.C.E.S.S. What Is This Process Called S.U.C.C.E.S.S. In order for desired results to manifest supernaturally you must follow the instructions. Not just any instructions but the right instructions. But first, a brief definition of instructions: directions, orders, or recommended rules for guidance, use, etc. If you must, please read it again to obtain a clear understanding. One of the most important things that I have discovered is that most people do not follow the correct or right instructions. Most people have the tendency to follow the instructions contrary to the correct or right ones. Hmm, this is really interesting! Now I understand why true success in every area of people’s lives does not come forth as promised by the written Word of God. Could it be that it comes down to hearing vs. listening, obedience, understanding and applying authentic positive action? We have been talking about “success” and or being “prosperous which equals success” principles in every area of our life and how you can apply them in your daily life so that success manifest supernaturally. Applying the principles is still not enough. Something else is required, and that is being obedient to God’s statues, and the “anointing” so that you triumph or have (victory) in Christ on this earth and while you are on your way to heaven! Be thankful for everything, not just for what he has done for you now but..
What you see before you is the First Hard Copy of my new book, Hot off the PRESS!! It is an exciting time! Stay tuned in for the release date, it is just around the corner, and the date will be posted on this blog, by email, facebook, and twitter. I invite you to register NOW! Along with the book their will be an Audio Version, Caps and T-Shirts. Look for special discounts. Stay tuned because 10 registered users will receive a complimentary cap or T-Shirt with their order. To view the caps and T-Shirts click on one of the highlighted links. Those users who have received my newsletter are automatically eligible. Do you realize that oftentimes the goal itself is the only reward? Also important to the discussion of goals is to find out what the child actually perceives the reaching of the goals will mean. Working through these systematic ideas will many times grow into actual goals and lead to success. I invite you to download an complementary chapter by « clicking here » and register on the website. Pre-Order: After you provide a comment and subscribe for book updates. Click here to order Now! Thoughts, we all have them everyday; this includes negative thoughts and positive thoughts. The important factor here is that we must become aware of the thoughts that we are having. Why is this important? 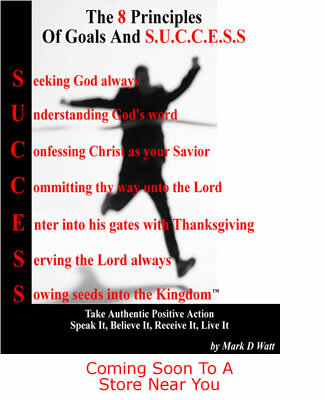 Follow book author Mark D Watt at http://www.twitter.com/mdwatt and connect with him on Facebook.